The Wall Street Journal ran an editorial last week by Bret Stephens describing the human cost of policies that produce and maintain poverty, as opposed to those that promote wealth creation. It describes the two recent earthquakes in Haiti and Chile and notes that Chile’s earthquake was physically much stronger than Haiti’s and yet the human and physical damage was dramatically lower. Capitalism, introduced to Chile by Milton Friedman and the University of Chicago’s economics department, wound up turning the economic fortunes of the country around in less than a generation and can plausibly be held responsible for saving countless thousands of lives in their recent earthquake. Last week I also finished reading a remarkable new book by Jay Richards entitled “Money, Greed and God”, which I discovered via the Cato Institute’s “Cato Audio” series. As we continue to debate the causes of the recent financial crisis and what to do about it, Richards’ book arrives on the scene just in time. 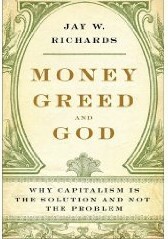 Suffice it to say, Richards thoroughly substantiates the message of his subtitle “Why Capitalism Is The Solution And Not The Problem.” But the applicability of “Money, Greed and God” goes far behind the recent events of the financial crisis. What makes it stand out is that Richards addresses many of today’s hottest public policy issues from a theological perspective, skillfully navigating the terrain where few dare to tread, that is, mixing politics with religion. Why is this so important? I can offer my views as a Christian, although I believe they apply fairly universally to the major religions of the world. The Bible offers no explicit blueprint for how to set up a government. Indeed, governments are entirely man-made creations. Yet there are at least two other areas that Bible talks a lot about: love and sin. We are charged to do well by our fellow man, to care, to love. Yet at the same time, we are sinners, so we are bound to make mistakes even as we try to care and to love. It would follow, therefore, that our man-made institutions are bound to make mistakes. If we truly care about helping our fellow man, to the extent that we attempt to implement more and more of our “care giving” and compassion through our government, do we have the responsibility as followers of God to monitor the progress? Do we also have the responsibility to change course if our original goals are not being met? We can read in Genesis that man was created by God, in His own image. Richards expands on that in a way that struck me as particularly novel. If God is the Creator with a capital ‘C’, then being created in His image, mankind has been endowed with the ability to create as well — we are creators with a little ‘c’. And mankind’s progress through history, with all of our worldly creations, should demonstrate that. But what have we “created” via our government, in the name of compassion? Is it working? At the end of the day, most of the programs and policies of government initiated in the name of helping people amount to rounding up resources from the private sector and redistributing them to others. And there are plenty of people who argue we need to do more of that. But if these programs and policies are in fact not working, or perhaps even making things worse, and yet we continue to do them, I would suggest that we are ignoring the original goal of helping others and instead focusing on how these programs make us feel instead. My guess is that it is a very rare sermon that gets into these areas. That is a shame, because it flies in the face of what believers in God are taught. As Saint James wrote (James 2:14-26 NRSV), “faith without works is dead.” But is faith though repeatedly failing works alive? Many people say that discussions of government, politics and economics have no place in and amongst religion. But consider this: It is within the collective of man-made public policy that people of faith must attempt to implement their ideas and beliefs. Some systems provide more fertile ground for implementation than others. And in fact, the policies and programs of government might very well be working at cross-purposes to the social goals frequently promoted by various churches and religions. In short, people of faith have every reason in the world to be concerned and involved with the workings of government. To whatever extent we ignore the efficacy of the government-led “solutions” to our society’s ills, all done with the best intentions in the name of compassion, I would suggest that we are engaging in a false compassion. Getting back to Haiti and Chile, it is very clear what economic framework saved lives, and what framework did not. I wouldn’t dare suggest that traditional missionary work is not vitally important. But when the earthquake struck, Haiti suffered as much from a lack of better construction materials and techniques, that is, better capital, as they did from the lack any particular religious teaching. As Christians and other people of faith seek Truth with a capital ‘T’, so we should seek truth with a lowercase ‘t’ when implementing our “solutions”. Examples of “false compassion” are legion and some obvious ones will make the point: Where is the compassion in minimum wage laws that produce outrageous teenage unemployment? Where is the compassion in high tax rates that are a proven disincentive to job creation? Where is the compassion in government run health care that is bankrupting our country? It is high time that our religious leaders take a hard look at the man-made systems through which they are attempting to spread and implement God’s word. We can not change God’s plans for our world, but we can organize our societies in ways that give His instructions the best chance of success. This surgery center could make it the most notable adaptable along with particular technique of conversation but produced to get successful muscle mass measurement passion. great read. I can see you put a lot of time into it. Keep up the good work! Thank you again, Civil Society Trust, for adding another great book. That I can read. Lets get those wage slaves working a 70 hour work week at minimum wage. No false compassion regarding unsafe working conditions . Death to any communist union organizers, Then when the boss piles up a fortune he can contribute money to Central American death squad groups like the founder of Dominos Pizza. Wealth for the bosses here on Earth. The wage slaves, if they work hard enough, will get their reward in your non-existent heaven. Really cool article you got here. I’d like to read more concerning that topic. Thank you for posting such data. Thanks for taking the time to write about this, I feel strongly about this and I take pleasure in learning about this subject. If possible, as you gain facts, please add to this blog with more information. I have found it very useful. I lately came across your blog and have been learning along. I thought I would leave my first comment. I don’t know what to say except that I have enjoyed reading. Nice blog. I will keep visiting this blog very frequently. It’s the best website, continue to keep so! This is thee reason I like http://www.yaliberty.org. Nice posgs.